The library can help you in determining how copyrighted materials can be used in the classroom. All members of the College community, including students, employees and visitors, must respect the intellectual property rights of others and comply with federal, state and local copyright law and any College copyright policies, procedures and guidelines. Proper use of copyright materials also extends to electronic resources available on the internet. 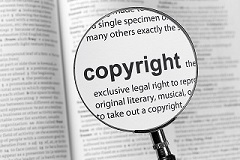 Copyright infringement is the act of exercising, without permission or legal authority, one or more of the exclusive rights granted to the copyright owner under section 106 of the Copyright Act (Title 17 of the United States Code). These rights include the right to reproduce or distribute a copyrighted work. In the file-sharing context, downloading or uploading substantial parts of a copyrighted work without authority constitutes an infringement.Creators of works hold ownership over their creations. For instance, someone can't take a novel, erase the author's name and sell it as their own. The complete version of the U.S. Copyright Law, from the U.S. Copyright Office. But there are times when you can use a piece of work even though it is copyrighted. Research, teaching, criticism, reporting and parody are all ocassions when copyrighted material could be used for free, without asking permission from the creator, albeit there are limitations. Fair Use is Section 107 of the Copyright Law. This is the American Library Association's version of the fair use evaluator tool. Useful guideline that helps you determine fair use for books, multimedia, and music. A helpful fair use evaluator tool. Copyright doesn't last forever. After a set amount of time, the copyright expires and the item falls into public domain. Items in the public domain are not subject to any private ownership; anyone can use them for free, without asking permission. Lists of works which have entered the public domain. Includes books, audio, video and images. The Technology, Education and Copyright Harmonization (TEACH) Act defines the use of copyrighted materials in specifically distance education classes. A look at the TEACH Act as determined by copyright law. Includes a handy checklist for Fair Use. File-sharing is the process of exchanging files over the Internet. One of the most common forms of file-sharing is using Peer-to-Peer (P2P) programs such as KaZaA, LimeWire or BitTorrent. Peer-to-Peer programs typically share files by default, to allow the maximum amount of sharing across the network. Most P2P usage (which comprises a significant fraction of all file-sharing) is against the law because it involves the sharing of copyrighted materials without permission from the copyright owner (copyright infringement), usually music (MP3) or movie files, but also TV programs, books and images. Students and others who engage in unauthorized distribution of copyrighted material, including illegal P2P file sharing, may be subject to civil and criminal liabilities. Students who violate this policy prohibiting copyright infringement, including the illegal use of P2P file-sharing, are subject to disciplinary action under the Student Conduct Code and may be subject to sanctions under the Appropriate Use Policy. Penalties under the Student Conduct Code may include warnings, loss of privileges, restitution, suspension or expulsion. Under the Appropriate Use Policy, the College may temporarily suspend, block or restrict access to an account, independent of any other disciplinary procedures, when it reasonably appears necessary to do so in order to protect the integrity, security, or functionality of College or other computing resources or to protect the College from liability. Employees who violate this policy are subject to all appropriate discipline, which may include loss of privileges, restitution, suspension or termination. In those instances where disciplinary action is warranted, the College's Office of Human Resources or appropriate academic administrators shall be consulted prior to taking such actions. Nothing in this policy is designed to conflict with any provision and any Collective Bargaining Agreement, and in the event of an apparent conflict, the college will apply a Collective Bargaining Agreement provision. Employees are also subject to any sanctions under the Appropriate Use Policy, including the temporary suspension, blocking or restriction of access to an account, independent of any other disciplinary procedures, when it reasonably appears necessary to do so in order to protect the integrity, security, or functionality of College or other computing resources or to protect the College from liability. Other members of the College community, including visitors, who violate this policy may suffer possible consequences including termination of any relationship with the College. The College reserves the right to pursue any appropriate action against such individuals. Any College action taken against a student, employee or other member of the College community for a violation of this policy may occur without regard to civil or criminal actions initiated by an outside agency against a member of the College community for the same violation. Sometime people forgo copyright and designate their work with a Creative Commons license. The creator is purposefully allowing others to use their work.